A powerful set of studio monitors with some extra facilities for tweaking the sound. Plenty of volume available. Decent bass reproduction. Tone-shaping controls. Plenty of rivals offer a similar product and some at a lower price. PreSonus has been known for its mixers, audio interfaces and even monitor controllers but surprisingly monitors have not been its roster. That's all changed now as the Louisiana-based company unveiled two distinct new studio monitor ranges at the NAMM show back in January. "It's no trouble getting a signal into the E8 - there are XLR, balanced TRS jack and unbalanced RCA (phono) sockets"
The E8 is quite a large nearfield monitor. Nice-looking in an understated way, the cabinet is vinyl-laminated MDF, all in black but with a touch of blue in the woven pattern of the Low Frequency driver's cone and with a PreSonus waveform logo that lights up blue when you turn on the power. 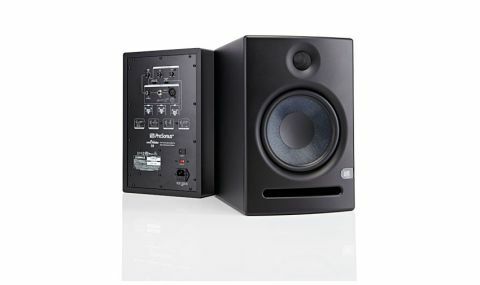 As is the norm for two-way studio monitors, the E8 is bi-amped. The 8-inch Kevlar low-frequency transducer is driven by a 75 watt class AB amp while the 1.25-inch silk-dome high-frequency tweeter gets 65W of class AB amplification. Besides the woofer and tweeter there's a horizontal front port. All connections and controls reside on the rear panel. You should have no trouble getting a signal into the E8 as there are XLR, balanced TRS jack and unbalanced RCA (phono) sockets. Besides the necessary input gain knob, the E8 has a range of controls for tweaking the sound. A pragmatic approach is taken by a three-position 'Acoustic Space' switch to compensate for any increase in bass response if you have no option but to place your monitors in corner positions or too close to a wall. This takes the form of a second-order low-shelving filter that can cut the level of frequencies below 800Hz by either 2dB or 4dB. The rest of the controls, which PreSonus call the 'Acoustic Tuning' controls, enable you to tweak the response to your taste or to emulate the sounds of different types of speaker. The High control is a high-frequency shelving filter that offers up to 6dB of boost or cut for all frequencies above 4.5 kHz, while the Mid control is a mid-frequency peak filter that boosts or cuts frequencies centred on 1 kHz with a bandwidth from an octave above to an octave below. PreSonus' own choice is a flat setting for both, so the rotary knobs for each are detented at 0dB. If you want to tweak the bottom end you get the 'Low Cutoff' three-way switch, which offers, besides a flat response, a low frequency roll off at a slope of -12 dB/octave below a frequency of either 80Hz or 100Hz - useful if you want to add a subwoofer to the system. WB E8's or a dirty limerick? "This is a speaker that could easily take care of all recording and mixing possibilities in a small studio"
Listening to a variety of commercially released tracks, mixes in progress and individual instruments through the E8 the impression was that here is a speaker that could easily take care of all recording and mixing possibilities if it was the sole monitor in a small studio. Clarity is good and the overall balance of frequencies is one that you can work with, the top end coming through prominently and clearly revealing the detail, while the bottom end is tight and focussed and extends down far enough to allow you to make those important mix decisions. As for the Acoustic Tuning controls, the flat sound worked just fine for us, but we could appreciate how a small cut or boost of the High control might appeal to some tastes or be useful to compensate for room conditions, although we'd have preferred switching rather than a small rotary control to keep left and right consistent. PreSonus proposes that use of the Mid control can emulate other speaker systems. They say that turning it down will emulate the smiley face curve of a car stereo while turning it up (in combination with the Low Cutoff switch) will emulate a cheap portable radio. It's an unusual feature to add to a studio monitor and it's probably no bad thing to have an extra tool in the box... as long as you remember to reset it. The thing about having your own set of studio monitors is familiarity, letting you make sound mixing decisions based on the consistency of your listening experience. The E8 will let you do that but we'd just set the EQ flat or tweak it to taste, leave it and get used to it. OK, so we looked up what Eris meant. There are a couple of things, one being the Greek goddess of chaos, strife and discord, which doesn't sound quite right for a studio monitor, although it is designed to help you transmute the chaos and discord of an unmixed track into a thing of beauty. Our view favours the first two over the latter. The E8s are no dogs, we'd be very happy to use them to mix our tracks and yes they can sound quite massive for such a compact cabinet. What you are getting here is a monitor that should fit tidily into most rooms and will let you hear the detail in your mixes. At a street price of around £400 a pair it has quite a lot of competition, but is a valid choice in that price range.